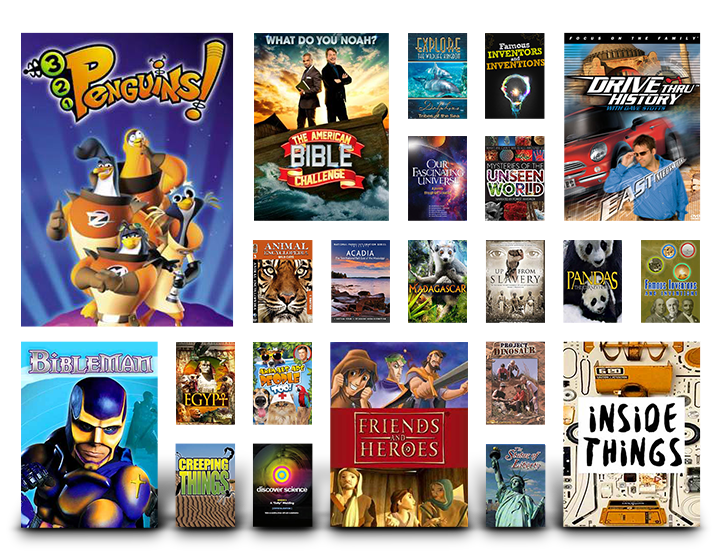 Bring your homeschool lesson plans to life with engaging documentaries, movies, and series you can watch anywhere. Download free materials and weekly video guides that pair well with any textbook. Homeschooling families are sure to enjoy these supplemental tools no matter what grade level their student is in. Developing a well balanced homeschool program can be a challenge and every homeschool parent understands the annual struggle to compile the best lesson plans, educational materials, and resources. Whether you are teaching a visual, auditory or tactile learner, supplementing your lessons with video content can be a great way to add to the educational experience. It has never been easier to find quality homeschooling materials online that cater to any learning style. Adding media to the lesson plan is simple at any grade level. Your little one in kindergarten will love learning about biblical values on Veggie Tales just as much as your senior in high school will enjoy streaming the latest documentary on the Civil War via any one of our mobile apps. Your homeschool curriculum needs to be high-quality, affordable, and easy to use. That’s why online video is a great add to any curriculum library. All of our content is a perfect fit for producing a safe and friendly environment for your children to learn. Learning shouldn’t be over-complicated. Have your homeschooling program delivered right to your email inbox with the best recommendations for every core subject in your curriculum. No more searching for the right resource! Research has long demonstrated strong connections between visual clues, memory, and knowledge recall. Video is one of the best ways to mix learning styles, incorporating visual and audio to help the most important information stick. The best part about homeschooling is that it makes education a family affair! Movie nights are a learning opportunity too, and with thousands of documentaries, films, and series to choose from, make your homeschool curriculum fun. Teach counting, colors, and Biblical values all at the same time with popular educational titles like “Owlegories”, “Veggie Tales”, and "3-2-1 Penguins". Go back in time with “Friends and Heroes,” under the sea with “AquaKids”, or an adventure with "Incredible Creatures that Defy Evolution". See the places that made history with “Drive Thru History”. Explore how "Awesome Science" is with teenager host, Noah Justice. Learn about points in American history with “The Ultimate Civil War Series” and see missionaries explore the world with “Travel the Road”. Homeschool families understand that you can’t separate faith and family from education. Whether it’s quality entertainment or educational resources, whatever you find on PureFlix.com has the same mission: to influence culture for Christ. We want to be your trusted partner and help you and your family continue to grow and learn together by finding the most appropriate Christian homeschool curriculum for your needs. BONUS: Pure Flix Members Currently Get 3 Free Months of SchoolhouseTeachers.com. Enjoy some of the best in wholesome video content and quality educational resources with PureFlix.com and SchoolhouseTeachers.com, an online homeschool curriculum library. For a limited time only, you not only unlock educational video resources, you also get additional support in three months of free access to homeschool study supplements from The Old Schoolhouse and Worldbook Online.